Huge 5 Bedroom Beach House just 200 yards from beach with small private pool. Great beach home for large families, easy beach access. 4. 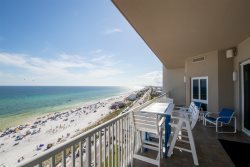 Conveniently located near many restaurants and activities in Destin and SanDestin area. This exquisite 5BR/5.5.BTH home in Miramar Beach, Fl, is just minutes from the beautiful beaches of the Emerald Coast. The 3600 sq ft. home includes a private back yard with a small pool perfect for relaxing in the Florida sunshine or giving children an alternative to the beach . The house offers a large kitchen, stainless appliances and gas stove. Several flat screen TVs and cable internet with wifi are also included. Perfect for families enjoying a beach vacation together, the house sleeps 17 in beds plus 4 more in sleeper sofas. This first floor is also the entrance to the private pool, patio area, and gas grill.